The Ministry for Higher Education, Research, Science and Technology is responsible for the effective development of an education system that will enable the nation of Papua New Guinea’s future development. Other government education agencies include the Commission for Higher Education, which is responsible for coordinating and delivering higher education effectively within the allocated resources available. In terms of accreditation, foreign students must have credit passes at form IV level in English, mathematics and sciences in order to be considered for acceptance to the higher education institutions in the country. There are 12 years of school education comprising six years of primary and six of secondary, with cycles of four and two years. The school year starts in January. 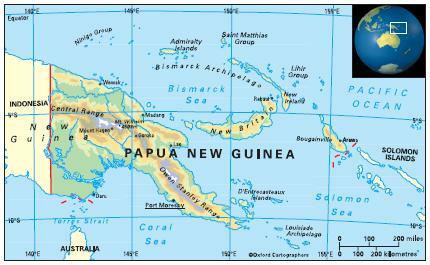 There are four public universities: the University of Papua New Guinea (Port Moresby); Papua New Guinea University of Technology (Lae); University of Goroka (Goroka), which trains teachers; and University of Natural Resources and Environment (Kerevat, East New Britain), which trains people for agriculture and natural resource management. The longest-established private universities include one founded by the Roman Catholic Church, Divine Word University at Madang; and one by the Seventh Day Adventist Church, Pacific Adventist University at Boroko, Port Moresby. The National Polytechnic Institute at Lae is one of several tertiary institutions offering courses in technical and vocational education. Literacy among people aged 15-24 is 68 per cent (2010).